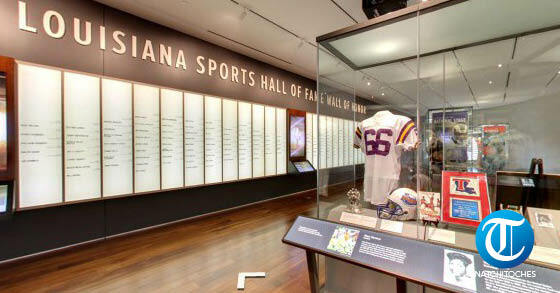 While the Louisiana Sports Hall of Fame and Northwest Louisiana History Museum has not been immune to State budget cuts this year, it is faring better than others. The staff at the museum has been reduced from four to three with the loss of a security guard. So far there has been no reduction in other funding, personnel nor hours of operation. The museum system that includes the local museum and eight others received a 17 percent budget cut this year. The budget cuts and vibrancy of the local museum were among the topics discussed when the La. Sports Hall of Fame Foundation board met here Tuesday. Among those attending was Steven Maklansky, below, interim director of La. State Museums. Those who met Maklansky Tuesday were impressed by his interest in the La. Sports Hall of Fame and Northwest Louisiana History Museum. Doug Ireland, chairman of the Hall of Fame, said Maklansky and museum patrons, supporters and personnel of the museum discussed the long-term investment the State has in the museum and its impact on those who live and visit here. Maklansky has been a part of the museum since he was on the State staff that took the museum from its conceptual phase to fruition. “He was here to talk about how we can enhance the visitor experience and develop long-term opportunities. We want to work with the museum system to everyone’s benefit,” Ireland said. Sharon Gahagan is a board member for the La. Sports Hall of Fame Foundation and is also on the La. State Museum Board. Gahagan says she and other representatives had “very honest conversations” with Maklansky about options that will help keep the museum operations in tact. Gahagan says the foundation board and other parties have been proactive in recruiting events for the museum such as the Natchitoches-Northwestern Symphony Society wine and cheese party in September. The event was also held at the museum last year. The museum has lowered its initial rental fee from $2,000 for an evening to $800, a more realistic fee for this area, to encourage more events. The annual budget for the museum is in the range of between $420,000 and $430,000. The museum generates approximately $20,000 annually. Other local foundation board members who attended the meeting were Dustin Cross and Frank Douglas.